I'm trying to find a small rotary switch. Would the above switch work for the Threeler? i used this one from mouser: 690-C5P0206N-A, works great. outstanding module! initially i used an undocumented switch from the spare parts bin--but the first few times i dialed it, there was a catastrophic short that blew fuses and shut down modules. I assume it was a shorting rather than break-before-make switch, but I didn't check, just pulled the thing out and threw it away before it did any serious damage! I finally got mine going as well. Dont remember how... I think Q3 ws burned. My oven hot OTAs survived thank god, and this thing just RIPS. I just finished the Threeler today. Man it's very cool! It will take me some time to fully get the scope of it. It is very wicked though! Right now it's starts self oscillating around 11 o'clock on the Res pot. Compared to other filters I have this seems rather early in the rotation. Does this sound correct for this filter? I know it works a little differently and even requires some resonance to pass audio from Output 3. I used the Bridechamber parts kit and I am running the module at 15V with the suggested resistor changes. Right now it's starts self oscillating around 11 o'clock on the Res pot. Compared to other filters I have this seems rather early in the rotation. Does this sound correct for this filter? Yep, that's exactly right. The reason is that there is lots of nonlinear and chaotic action above resonance. Play with the higher resonance settings with the input level fairly low and you should see what I mean. Thanks for your response Ian.Yes I see what you mean, I got to spend a lot of time with the filter in the studio today. It is really a fantastic filter! Great job on the concept and design. It will be one of my favorites for sure. Posted: Fri Apr 20, 2012 5:27 am Post subject: docs ? Posted: Fri Apr 20, 2012 7:27 am Post subject: Re: docs ? They should be emailed with purchase, but sometimes Scott needs a reminder. i'm almost done with my threeler. the things is about that R36a again.. sorry i red all i could about it but my english seems bad enough i don't understand it. Q1/ Q2 are the matched pair, in this case the 2SA798. It can go in either direction, in the five pins. After that, put the tempco in R36a, leaving the legs long enough so that the resistor goes over the matched pair, so that you can pull it tight w/ some thermal compound between them, making a good physical connection. so you put a798 first then R36a and stick the R36a thing to the top head of the a798 ... if that's what i understand what is it for ? thermal something ? or does it have to do with a special way to sold the legs behind the PCB ? other question about the construction part. i see on davebr's picture that he has a metal plate to hold the PCB. i don't have this plate is it missing from my kit or did davebr built it himself ? I put in the 2SA798 unsoldered and then formed the leads of the tempco so it would fit tight against the 2SA798. This required bending the leads both inward and around in order to fit properly against the side of the 2SA798. Then I soldered in the 2SA798 at the proper height. Then I removed the tempco, applied heat sink grease on the side of both the tempco and 2SA798 and installed and soldered it in. If you are using the Bridechamber kit you do not need a bracket. The board is supported by the pots. I choose to use a bracket on any module I build so I fabricate one for all DIY modules. I have 0.050" sheet aluminum that I use. It's thin enough to mount behind potentiometers and jacks and easy to form. The board is supported by the pots. oh btw special hello to Argitoth who gave me the will to do that wonderful threeler with his soundcloud demos ! RadioShack does sell heat sink grease. wouhou ! sounds great. really happy to have that in my synth and all the nice options on it. i have something i don't understand. The first and second stages are a bit weaker, but you should still see a definite resonance. Make sure you don't have the input up too high. output 3 = same but reso acts like a volume. when set to0% it cuts the sound. Correct, it has to be part way up. Don't know why you are not seeing resonances. Are you sure the resonance control is up far enough? Make sure you don't have the input up too high. it sounds terrific. my favorite filter by far thx for make it ! output 3 = same but reso acts like a volume. when set to 0% it cuts the sound. I biased my resonance control slightly on so I always have an Out3 signal. It didn't take much and seems to work quite well without having any significant effect on the resonance. Ian, I just logged in to say that your filter is the best I've ever used. A big statement and yet completely true. I've been a fan of 3-pole filters for a very long time. My opinion is that a good 3-pole design provides a more balanced and musically useful result than either 2-pole or 4-pole in most cases. This particular implementation does this and is also the best sounding one, and getting no muffling whatsoever of the high frequencies is great. The combination of 2-pole LP or HP with 1 LP or HP is also a really great idea, finally making things like "band-pass" sweeps more "musical" than ever. I've attached a simple little example to show people how awesome it is. I got the filter from Scott / Bridechamber and I have to mention it was very nice to deal with him. 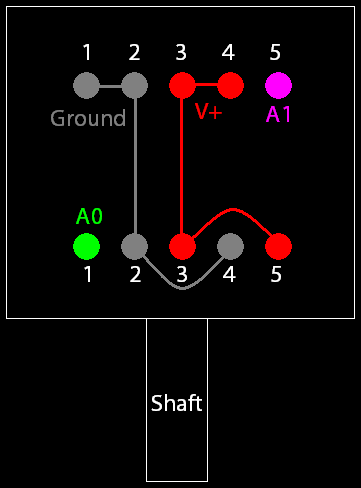 Chord from 3 sawtooth oscillators (Q106), Threeler VCF in 3-pole low-pass mode, output 2. I've been a fan of 3-pole filters for a very long time. My opinion is that a good 3-pole design provides a more balanced and musically useful result than either 2-pole or 4-pole in most cases. Yeah, I wonder if the reason is the same as why a lot of folks like 3P for speaker xovers? Thanks for putting that up -- sounds great! finished my Threeler yesterday using a Bridechamber part-kit. Flawless build, everything worked as expected from the first switch-on. Added one mod stated by Dave Brown, just one more resistor (1M5) on the tl072 to keep the reso up a little bit, so all outputs work perfect in every mode without turning up the reso-pot. In other words : G R E A T !!! I think that somehow it generally resembles resonance properties of things in nature more than 4-pole which may be too steep in comparison. Instuments, voices, structures. For example, I'm sure you know how the character of your filter in the second output is surprisingly voice-like, no multiple filters and no special tweaks, just a single 3-pole filter with some resonance. I think the "vocal" quality of it is not really vocal quality, but simply natural quality, but we just naturally tend to associate it with voice. On another note, there is a lack of demos so I've attached a trippy acid/trance sample for anyone who wants to hear what a super tough 3-pole filter can do in a production-ready setting.